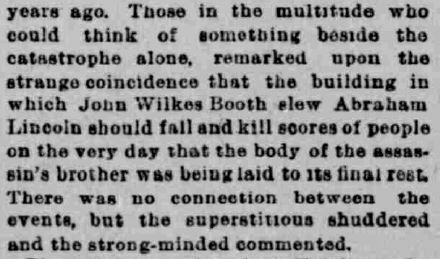 Exactly 150 years ago today, Abraham Lincoln, who spent part of his rail-splitting boyhood in Spencer County in southern Indiana, fell victim to the bullet of the 26-year-old actor John Wilkes Booth at Ford’s Theater. Soon, the president’s body headed west by train, stopping in Richmond, Indiana, for a public viewing at 2:00 in the morning on April 30, then on to Indianapolis and Michigan City, with short stopovers at small Hoosier train stations along the way. In a downpour, possibly fifty thousand Hoosiers viewed Lincoln’s open casket in the rotunda of the old State House. (At a time when the population of the capitol city was less than 40,000, the crowd of black-draped mourners must have been a spectacle in itself. Many were African Americans clutching copies of the Emancipation Proclamation.) 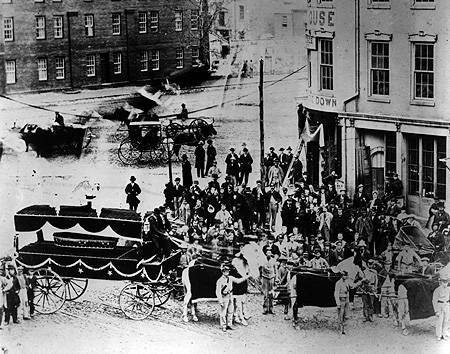 Just before midnight, a carriage brought the president’s coffin through the rainy streets of Indianapolis, lit by torches and bonfires, to Union Depot, where it departed north by train for the south shore of Lake Michigan, en route to Chicago and eventually to Springfield, Illinois. 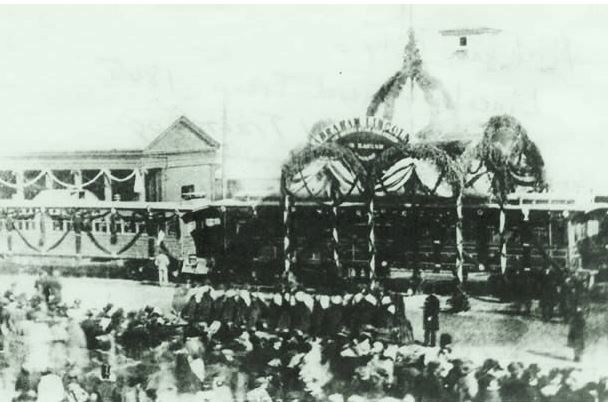 Lincoln funeral cortege in Michigan City, 8:00 a.m., May 1, 1865. An exhibit running through July 7 at the Indiana State Museum, So Costly a Sacrifice: Lincoln and Loss, includes some actual “relics” of that fateful Good Friday in 1865 when Booth shot Indiana’s favorite son. Among the artifacts are a few that seem like medieval religious relics: clothing with spots alleged to be the blood of Honest Abe, and a piece of the burning barn in Port Royal, Virginia, where the assassin met his own fate at the hands of a Union soldier, the eccentric street-preacher Boston Corbett. What happened to Booth and Corbett is pretty bizarre and appalling. Basil Moxley, a doorman at Ford’s Theater who claimed that he served as one of Booth’s pallbearers in Baltimore in 1865, fed a conspiracy theory in 1903 when he asserted that another man is buried in the plot and that Lincoln’s murderer actually escaped to Oklahoma or Texas. A mummy hoax brought the assassin back to life as a sideshow attraction in the 1920s. But perhaps the moody English-American actor would have been thrilled to know that the morbid tragedy he let loose wasn’t over yet. 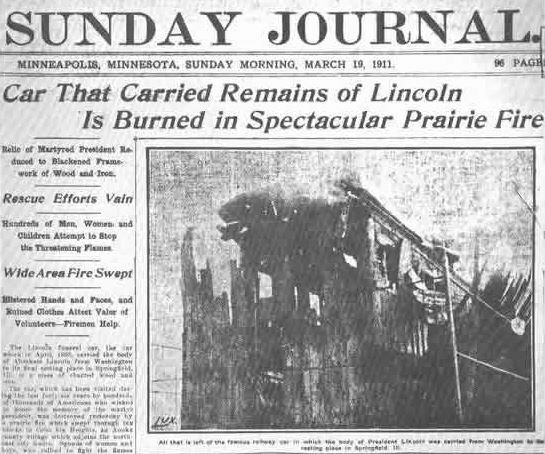 Minneapolis Sunday Journal, March 19, 1911. 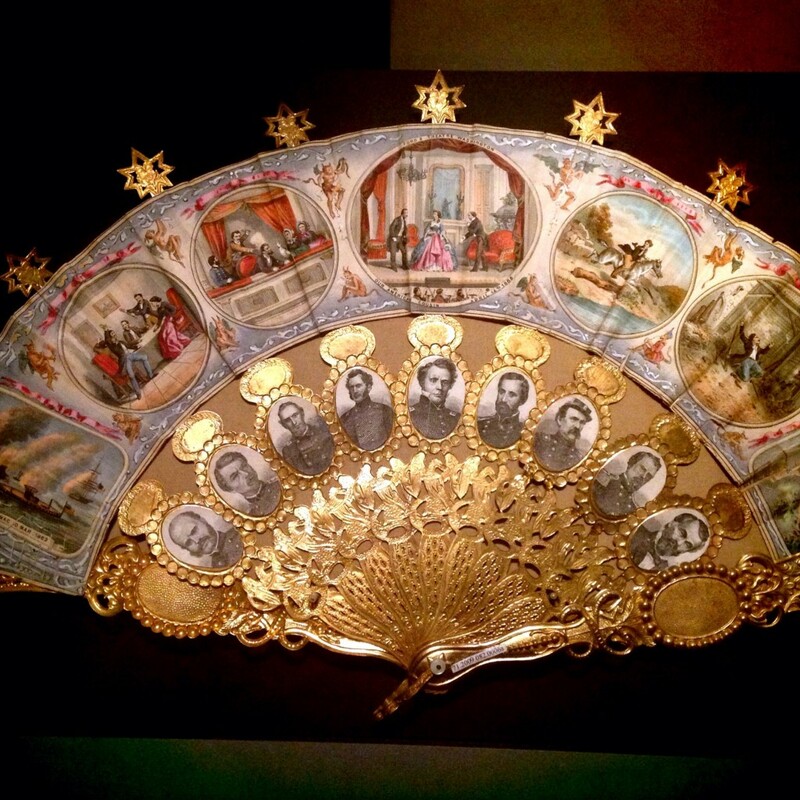 This decorative fan now on display at the Indiana State Museum commemorates the Lincoln assassination. John Wilkes Booth goes down in smoke on the far right. Hundreds of men carried down by the floors of a falling building which was notoriously insecure; human lives crushed out by tons of brick and iron and sent unheralded to the throne of their Maker; men by the score maimed and disfigured for life; happy families hurled into the depths of despair. . . Words cannot picture the awfulness of the accident. Its horrors will never be fully told. Its suddenness was almost the chief terror. . . Women who kissed their loved ones as they separated will have but the cold, bruised faces to kiss to-night. . . In the national capitol of the proudest nation on earth there has been a catastrophe unparalleled in the annals of history, and in every mind there is the horrible conviction that its genesis is to be found in the criminal negligence of a government too parsimonious to provide for the safety of its loyal servants by protecting its property for their accommodation. Ford’s Theater draped in mourning for President Lincoln. 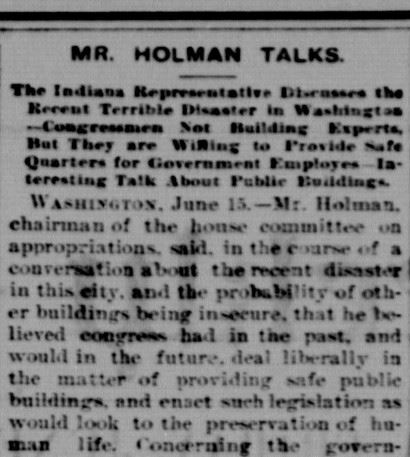 Collapsing structures were a major news item in the 1890s. Almost every week, American papers reported mass casualties at overcrowded factories and apartment buildings, especially in Chicago and cities back on the East Coast, where poor construction and dry rot led to the deaths of thousands of industrial workers and tenants — often women and children. During the Progressive Era, such tragedies inspired reformers like the photographers Jacob Riis and Lewis Hine (who documented child workers in Indianapolis in 1908) to illustrate the real peril of shoddy, dilapidated buildings in the workplace and at home. 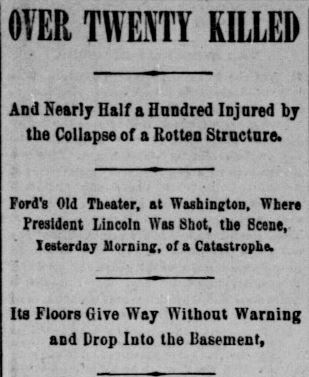 In 1893, Ford’s Theater was probably one of the most dangerous structures in America. Built in 1863 by the 34-year-old entrepreneur John T. Ford, the building occupied the site of a Baptist Church-turned-theater that had burned down a year earlier. John Ford’s business was a victim of Booth, too. After the Lincoln assassination, public opinion and the U.S. government both decided that it was inappropriate to use the site of the nation’s great tragedy for entertainment. Ford wanted to re-open his theater, but received arson threats from at least one Lincoln mourner. The Federal government appropriated the playhouse, compensating its owner with $88,000 in July 1866. Even before the government actually paid for the building, renovations were underway. 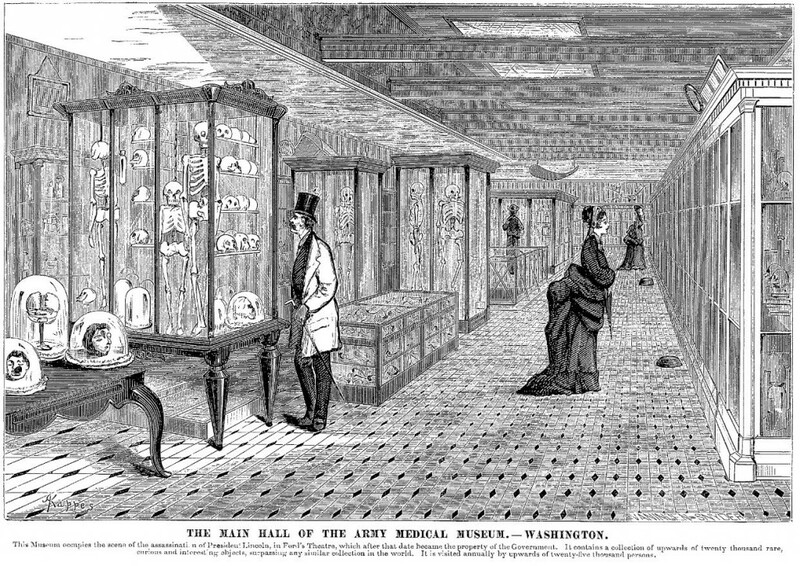 In December 1865, the suitably morbid Army Medical Museum moved onto the third floor. “A far cry from the once jovial theater,” the famous local landmark now housed an array of skeletons in glass cases, body parts, surgical tools, and other gory reminders of military medicine. The Library of the Surgeon General’s Office soon occupied the second floor. 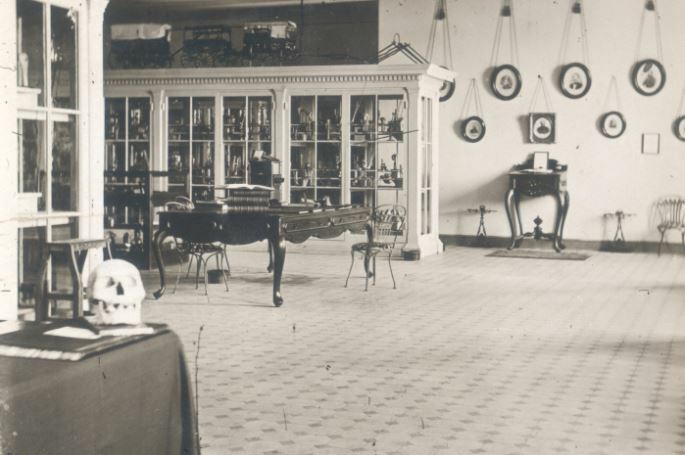 From 1866 to 1887, Ford’s Theater housed medical exhibits. An active theater for just two years, the place was a literal showcase of death for more than twenty. The museum later moved to a new location at 7th & Independence. 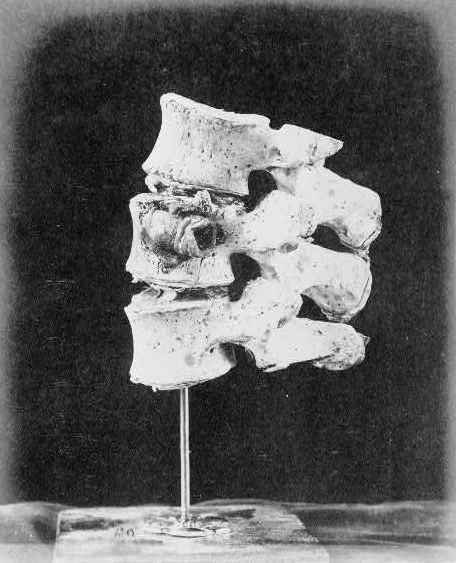 A section of John Wilkes Booth’s vertebrae was on display here for years. 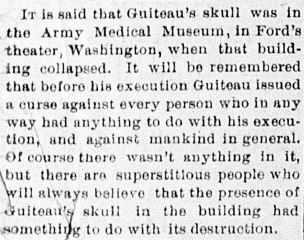 The Terre Haute Saturday Evening Mail reprinted an incorrect rumor that the skull of Charles Guiteau, assassin of President James Garfield, was on display at Ford’s Theater when the building collapsed in 1893. Guiteau’s skeleton did go on exhibit there, but had been moved to the new museum at 7th & Independence, where his brain and partial skeleton are still in the collections of the National Museum of Health and Medicine. Guiteau’s head was also reported to be touring southern Indiana during World War I. The other floors of the former theater housed the War Department’s Office of Records and Pensions. The unstable, visibly bulging building was the workplace of several hundred employees and was further imperiled by probably a few tons of heavy paperwork, the red tape of veterans’ pensions. As long ago as 1885, this building. . . was officially proclaimed by Congress an unsafe depository for even the inanimate skeletons, mummies and books of the army medical museum, for which a safer place of storage was provided by an act of Congress. But notwithstanding the fact that in the public press, and in Congress, also, continued attention was called to the bulging walls of the building, its darkness and its general unsuitability and unsafety, it continued to be used for the daily employment of nearly five-hundred government clerks of the pension record division of the War Office. 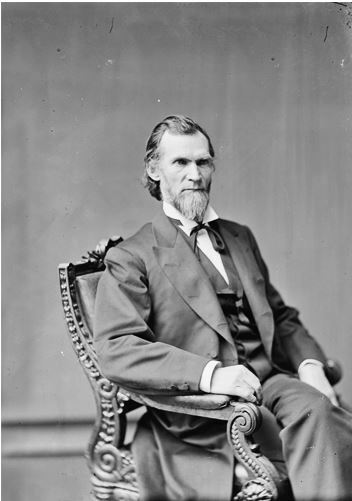 U.S. Representative William Steele Holman of Aurora, Indiana, kept a famously tight wallet but was a great opponent of land monopolies and unregulated corporations after the Civil War. He helped establish Yellowstone National Park and was described as “a botanist of no mean ability” and a friend of public forests. 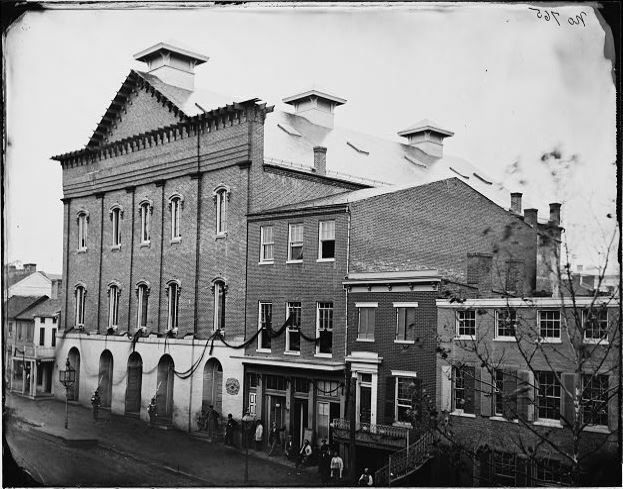 Yet once it was rebuilt after the 1893 collapse, Ford’s Theater returned to government use — oddly enough, as a storage warehouse for the Government Printing Office. 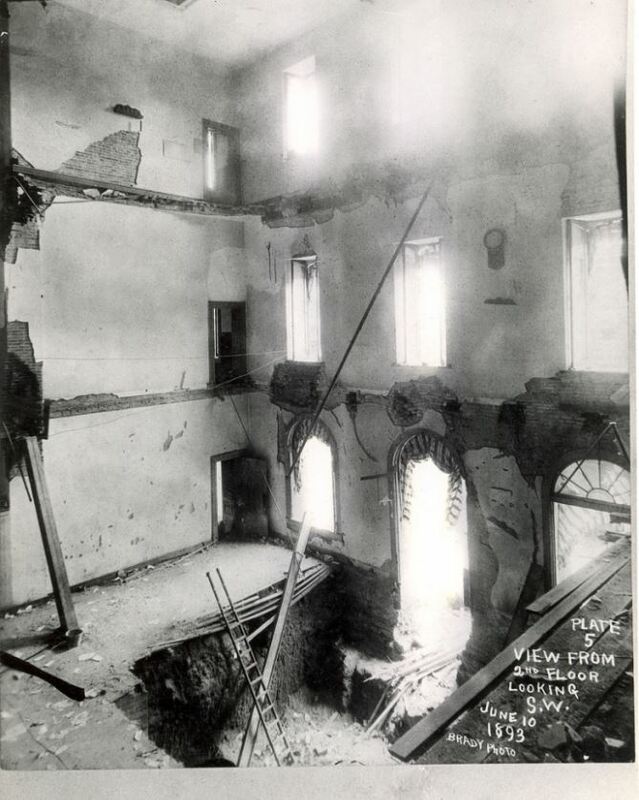 The building narrowly survived being condemned for demolition by President Taft in 1912. From 1931 until renovations in the mid-1960s, the historic structure housed a government annex and a first-floor Lincoln museum. Restored to its 1865 appearance and now run by the National Park Service, it opened as a public museum in 1968. Liberty Express, Liberty, Indiana, February 11, 1921. Ford’s Theater in an early 20th-century stereograph. 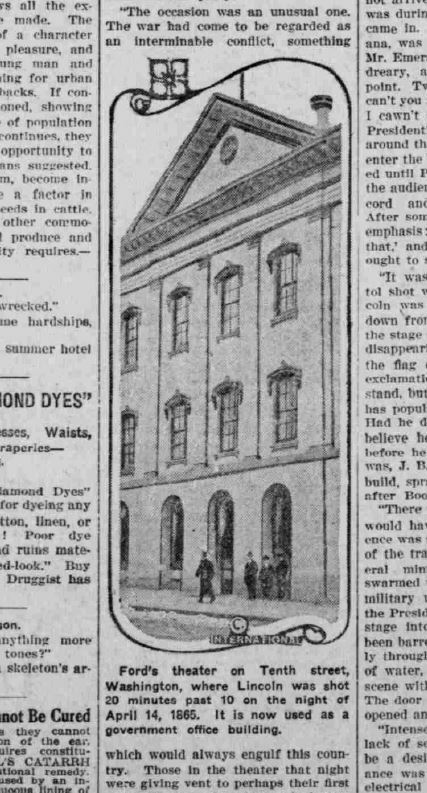 The Indianapolis Journal took note of the strange coincidence that Ford’s Theater crumbled on the very day that Edwin Booth was buried in Massachusetts. Edgar Allan Poe, author of “The Fall of the House of Usher,” would have appreciated the irony.